They call it CCX, from the Competition Coupe X in reality. A dramatic presence meant to change everything you know about speed , acceleration and mechanics.The real result could be for sure one of the mightyThor’s option. The model was replicated by AutoArt in the Signature edition and released back in 2011. An impressive model I can say from the first sight, but still a disputed one. I will take a closer look to the model and try to put in evidence all the good and poor parts. The beautiful and complicated design of the car appears to be good replicated in scale, the body following all the original lines. Is covered in a perfectly applied metallic paint, glossy and thin. I can't find any difference of the shade between the painted metallic and plastic parts. The model isn’t as heavy as I would like to be, but doesn’t look fragile. All the air vents are covered with real mesh some made of plastic like that one from the front bumper, some of metal. 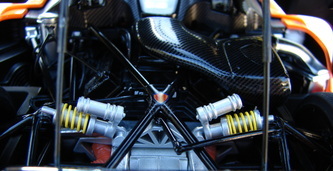 Front lights look very realistic, having the light bulb replicated together with the surrounding carbon pattern. The turn lights on the bumper sides are made of transparent white plastic and seem to be attached with a visible stub, but in fact is a timid attempt to replicate the light bulb. As I said the front air vent is covered with real plastic mesh, having the fog lights integrated. The bumper has the inferior “lip” covered carefully with a decal, which replicate the real carbon fiber. The result looks great and the decal is better applied in comparisonwith some previous models. On the both sides we can see the air vents covered with chromed metallic mesh which has a real texture and looks amazing. The mirrors are made of plastic and are including on their base the second turn light. The model’s stance is very good. Moving on the rear side , the taillights are correct, being individual pieces and having the irregular frame and the light bulb exemplary replicated. The air vents are included in a frame, covered by a grey paint. The final exhaust part is a good to be seen detail, being detailed with a high quality chrome. Some segments of the internal frame structure can be observed through the empty space, first to the air spliter made of plastic. The reverse lights and turn lights on the rear side are nicely done and colored properly. 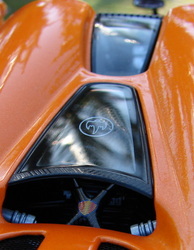 The manufacturer logo and lateral inscriptions are tampo applied except the “Koenigsegg” lettering, next to the front wheel, which is a photo etched decal. The sills are covered in the same carbon pattern look alike. AutoArt was very careful in replicating the rims. Being made of carbon fiber on the original car, the plastic used here has a very nice texture to replicate it. The spokes are painted and the grip part had the logo moulded on. The brake system was done with the same attention for details, the rotors are silver painted and the brake disks have the same color and texture with the carbon made ones on the real car. On the black painted calipers the manufacturer name was tampo applied. Not branded tire this time, but the profile is looking like real. In a short conclusion, I like the exterior a lot and in reality is better looking. Let’s move to the interior, but not until we speak about the most impressive part of the body: the unique Dihedral Synchrohelix door system- a fancy way to say the doors pull out than flip forward. The system was accurate crafted by Aa, even if you must follow 2 action to completely open the door, not just pull it like at the real car. Some “cool” guys in the hobby blame Aa for not having made the full functional system to open in the same way. Are the same people who mourn over about the price, without thinking, if such a complex mechanism was included, the price would be higher. For me this isn’t a problem at all, the actual opening system is cool enough, practical and durable being made of metal. Thumbs up, Aa! The interior is well detailed even if in some places looks cheap or improper finished. The carbon pattern on the dash board, door entrance, steering wheel or on the roof stand, looks amazing and is very well applied. The seats are made from a textured matte plastic along with shinny plastic for the laterals, just to exactly replicate the originals Sparco. Are branded with the name and the logo of the manufacturer. The central console looks a little bit plasticky and cheap, the silver paint here cancelling the real note. The shift gear is over sized and the pedals aren’t detailed, only paid in silver. Some more attention here, was mandatory. They chose to replicate the main indicator with a legible sticker. In the real car is no carpet, so the floor is covered with a textured plastic having the manufacturer logo paint in the center. Nothing more can be seen here, except the textile made seat belts with metallic photo etched buckles. The model features a removable plastic made roof. The both huge lids are functional. The rear one is including a metallic air vent and two windows, one being marked with the famous Koenigsegg’s ghost. All are surrounded by a very good looking thin frame replicating the carbon fiber. Is opening on two struts, but it doesn‘t stay open by itself(at least at my model). The engine is an immense mix of hoses, suspension’s parts and frame pipes. Is great detailed and looking awesome. In the engine bay the carbon fiber is everywhere as in the real one. The pieces are individual made and we have a lot of wires. Air filter is looking gorgeous covered in carbon and having the logo modeled in. The active suspension of the model is ready to be admired and the yellow painted springs are beautiful details in all this ensemble. 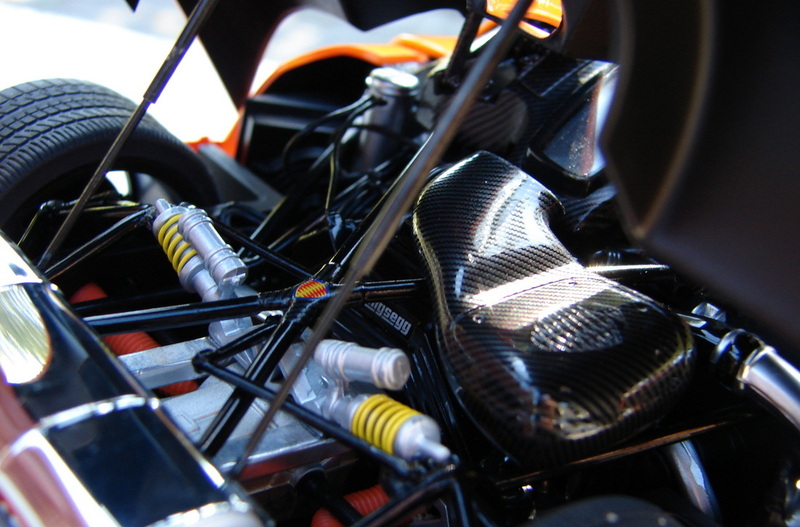 Even the brake cooling pipes are properly done and of course the logo and the name of the car are visible. The entire view is completed by the huge chromed exhaust. I really like what Aa did here. The front bonnet is functional, too. Is opening on two struts, full functional this time. Under it, is the removable roof place and no other detail is visible, excepting the general car’s structure covered with a wave texture to replicate the carbon fiber. 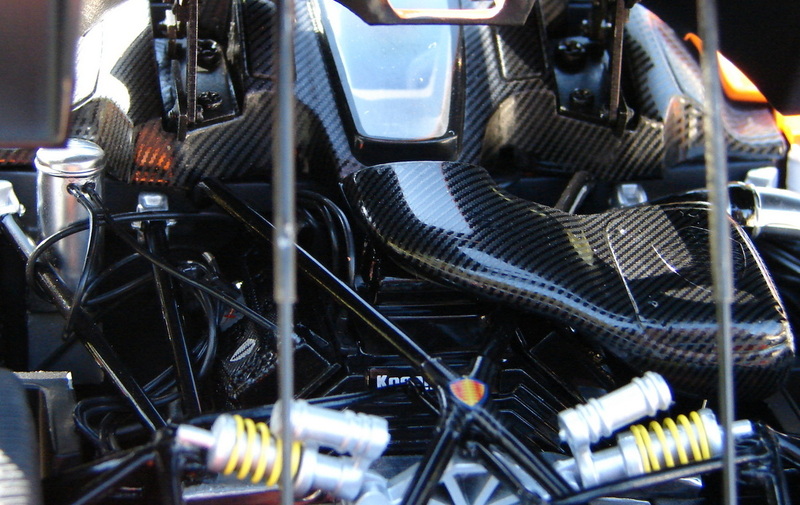 The same for the underneath of the model, being a super-car everything here is black and flat. Only the rear air spliter was moulded. I like this model very much and highly recommended to all the super cars lovers. I agree with the critics about the poor look interior, but being a simply designed part, even on the original car, for me this isn’t a great drawback. Is completed by the great engine details and the awesome exterior look. The model can still be find having a price under the recommended one, so don’t hesitate or you'll make Thor angry!